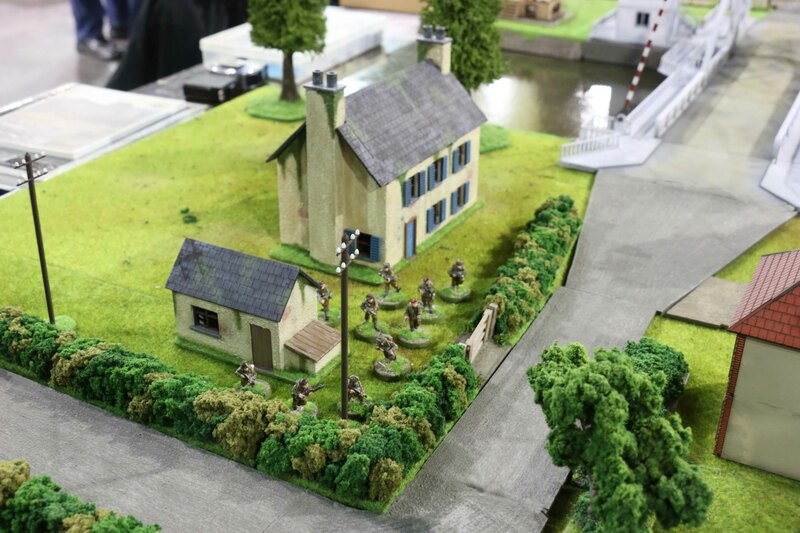 As you may know, we wanted to host Pegasus Bridge at Crisis in Antwerp this year (and eventually we did so). Between the three of us we already had a lot of buildings, hedges and so on. 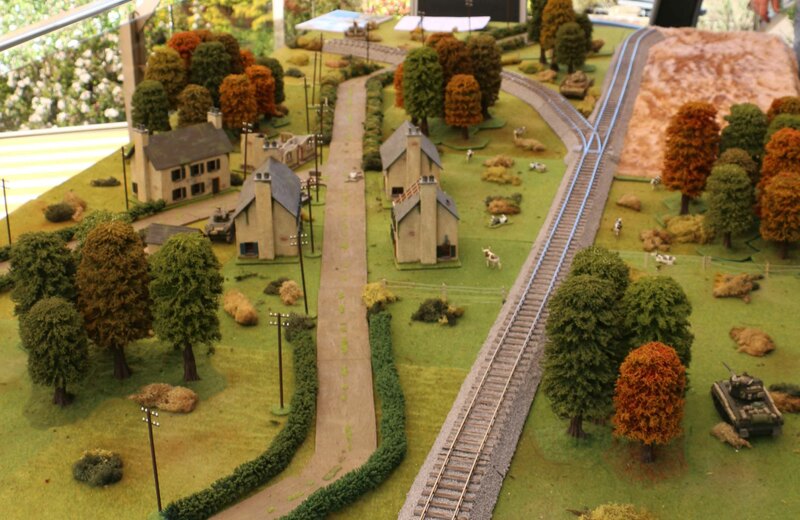 But this still required some more terrain. 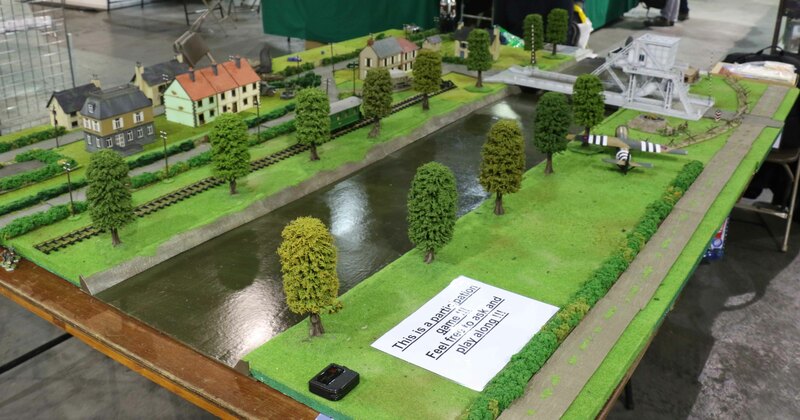 Not many buildings for the vicinity of the bridge were required, but I wanted some more variation. Since I still had the château from Sarissa Precission around, so that seemed like the natural option. 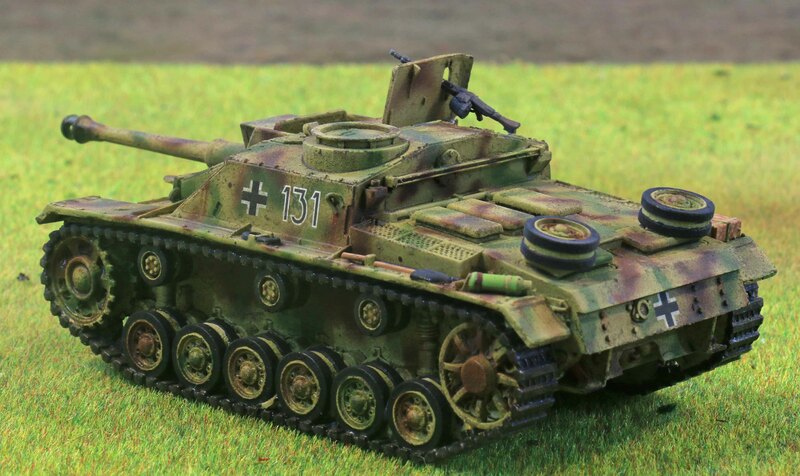 It had been a nice kit to assemble and was a nice kit to paint. 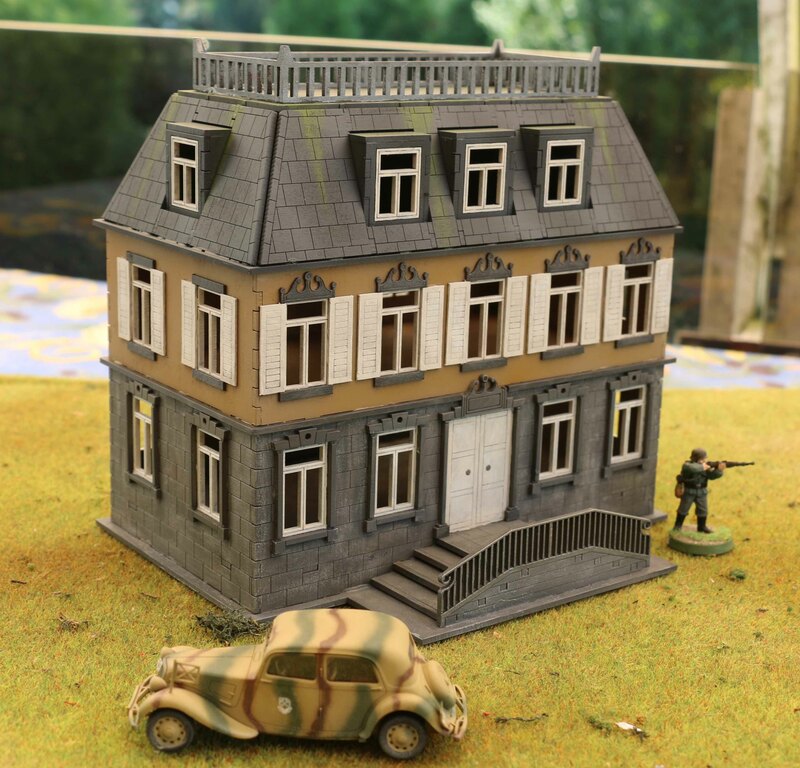 If I was to do it again though, I would probably leave the first floor windows and shutters off for easier painting. 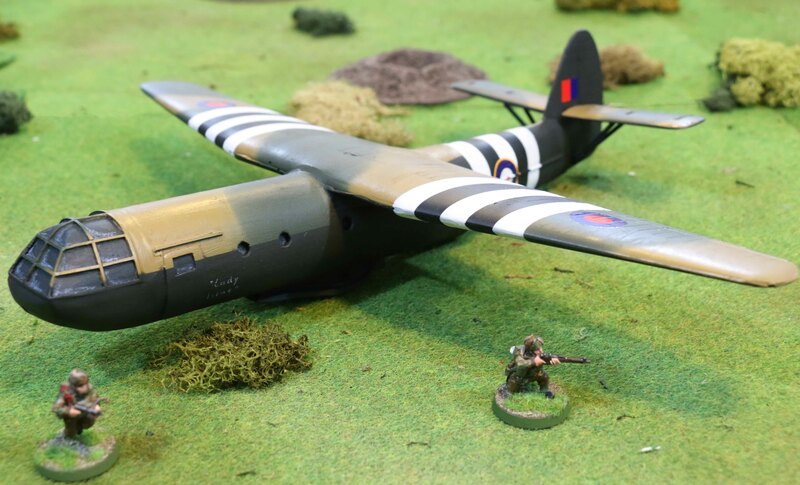 But we also needed a Horsa Glider for the game. Martin had a model by Grand Manner around. Martin was unsure if he could give it due credit, so I painted it up. 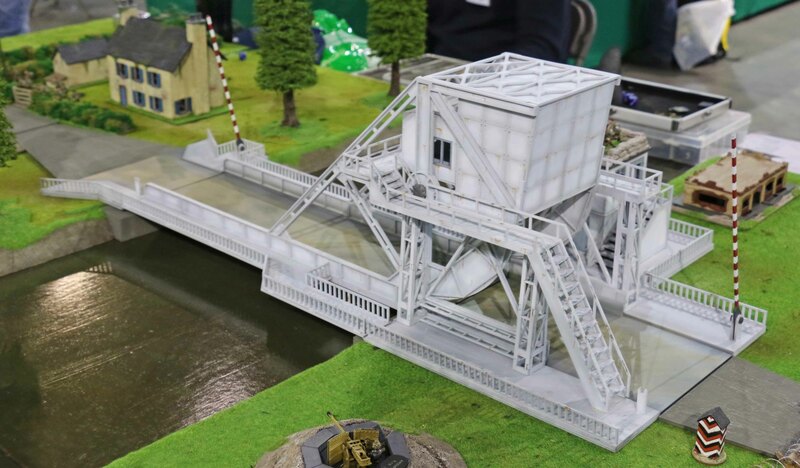 I Ieft the landing gear off to me the model fit the scenario since the Gliders used for the attack on Pegasus Bridge all had rough landings and ripped their landing gears off. It was nice enough to airbrush up, but I think the dimensions are somewhat off. 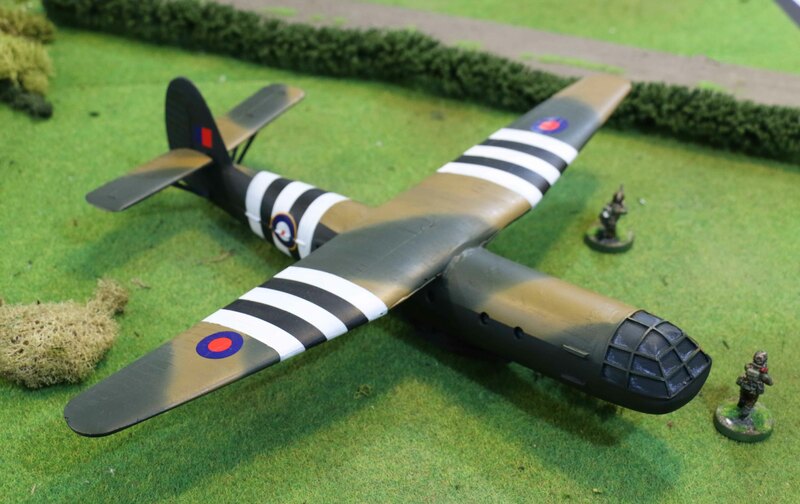 The lower hull and underside of the wings were painted in a dark green, the top in camouflage. So I started by doing the camo and then taped the edge off. Which is when I realised that something was amiss. For example I used the forward doors and tail wings as a guide, but under the main wings the lines ended up too low. But I felt this was acceptable, since people could hardly see this spot. So the lower half of the glider was painted in dark green and filters and washes applied. Now I taped off the invasion stripes and again, I noticed that something was not quite right, for there was too little space on tail. 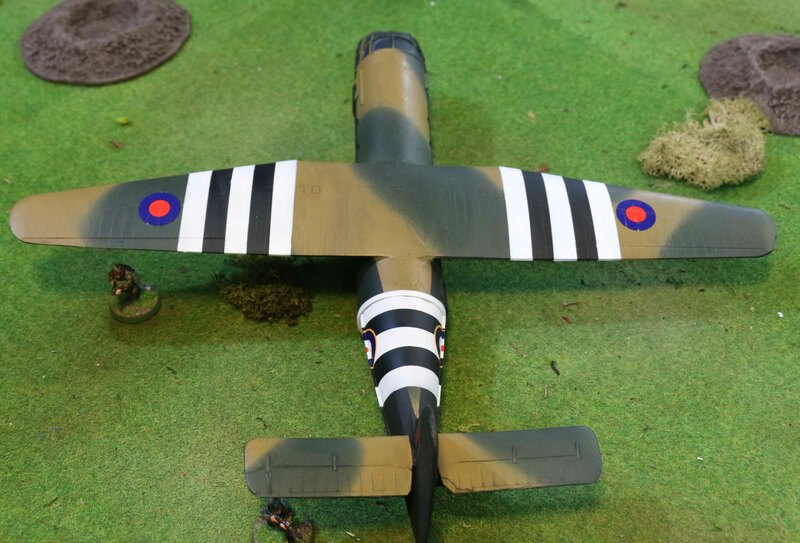 In the end the RAF roundels on the tail ended up overlapping the invasion stripes for that reason. To finish things off, I placed chalk markings on the flank saying “Lady Irene” to make it match the glider Major Howard landed in. And up last, the most importer building for the game… the bridge itself. Again this was a Sarissa kit. I had been too lazy to assemble the model, so I bought a model that had already been build and sold my kit on. In retrospect, this did not make things that much easier, since it had not been assembled as clean as I would have done, so I had to do a lot of sanding and so on. I wanted to keep it in the very light grey of the original, but in the end, this seemed a little bleak to me. So I added rust marks to the model, which gave it a lot more character. 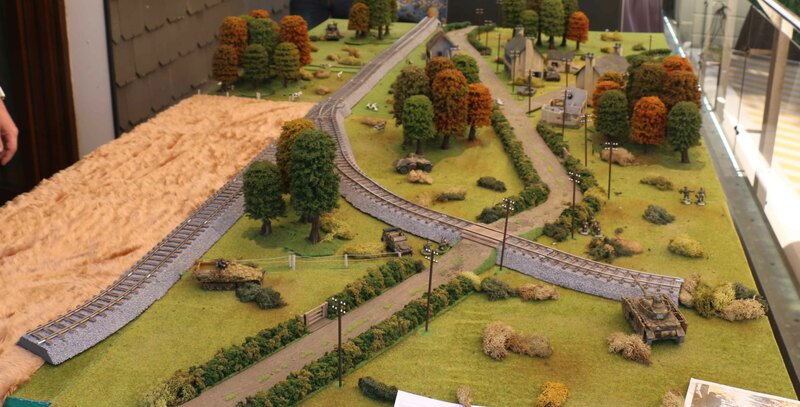 If you want to see some more detail shots of the bridge, those can be found in my post about the British Paras. In the, it turned out to be quite a nice game. 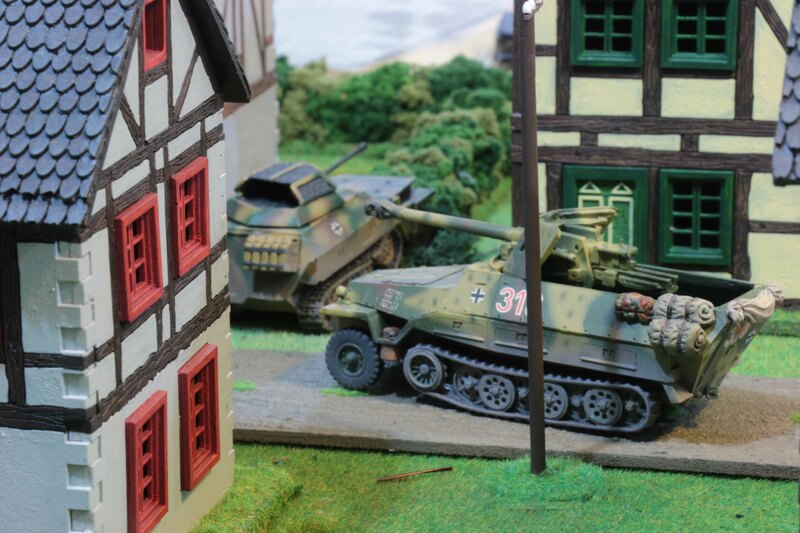 We used the Battlegroup Overlord rules and they worked very well even at this small size. It was especially interesting to see how different tactics played out. 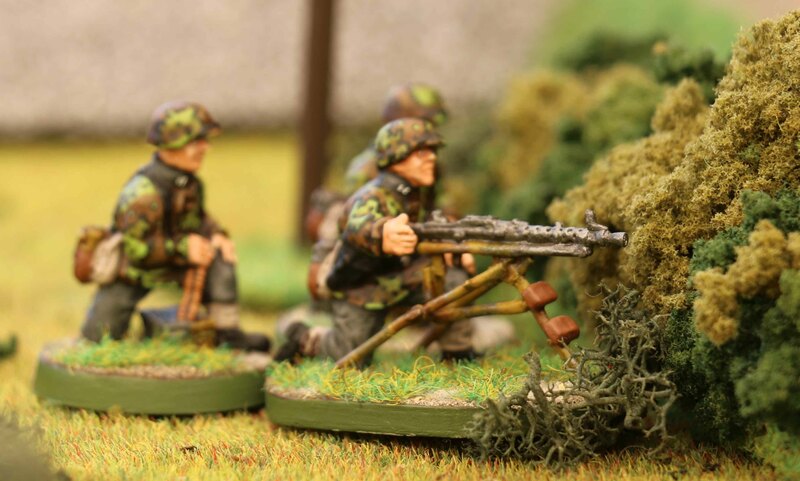 If the British went for a defense in depth, it usually went well for the Germans, since they could usually wipe out the British first line of defense (after stumbling into it) and then using the superior range of their SP gun(s) (,depending on how many survived the PIAT,) to destroy the rest. 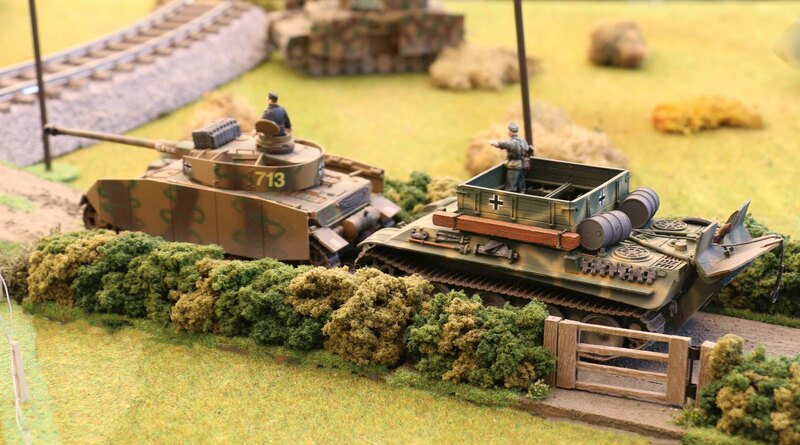 If the British went for a strong first line of defense, the Germans were too weak to protect their SP guns sufficiently and took too many loses to take the bridge. It will be interesting to see how future games play out. 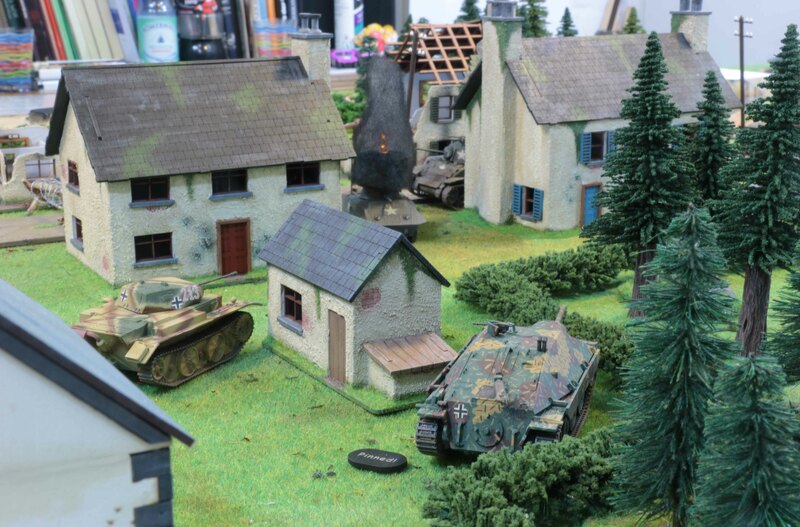 So I am leaving you with a (very) few pictures from the game at Crisis. 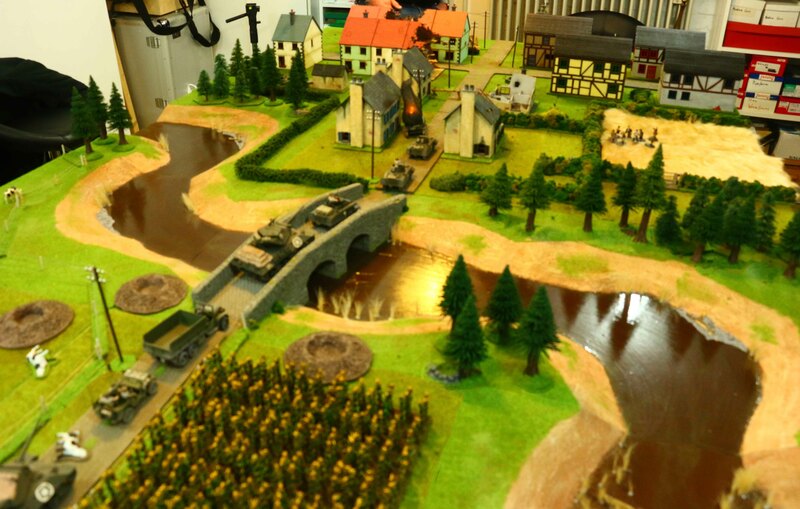 Between Christmas and New Years last year Julian, Martin and I met up for a little game of Battlegroup Fall of the Reich. Please do not ask for the exact composition of the forces… it has been a while. 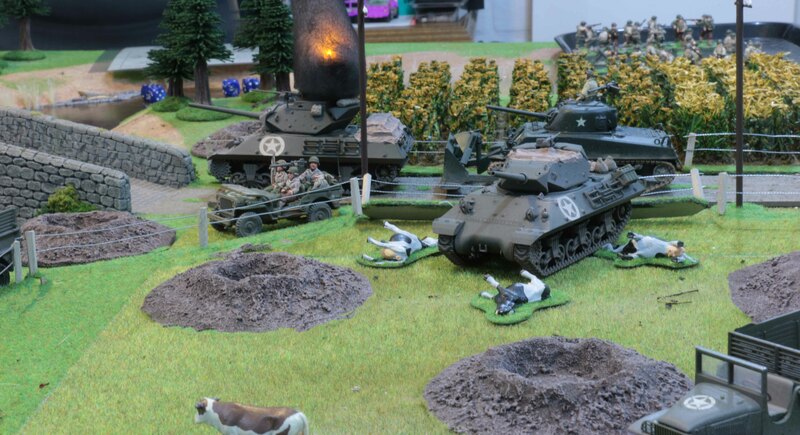 But if I remember correctly, the Americans had a mix of truck and jeep mounted infantry, M10´s, Shermans and Greyhounds (the burning Stuart was scenery). 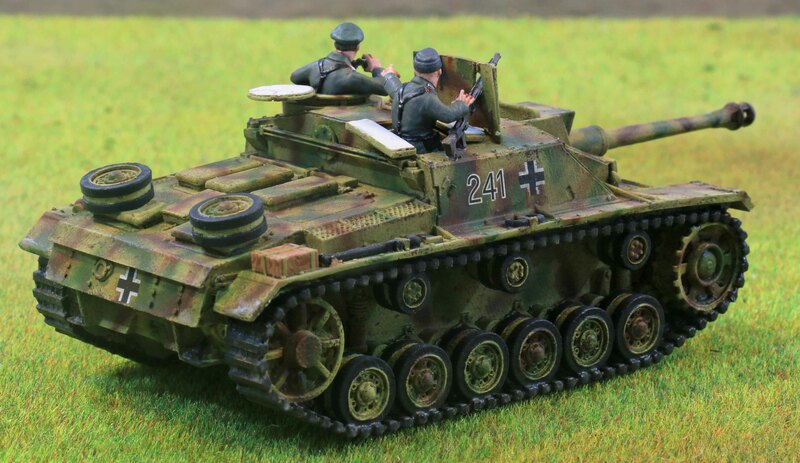 The Germans were a rag-tag bunch of Panzergrenadiere, a Volkssturm platoon, two Hetzer, a Hornisse, a Luchs, a SdKfz. 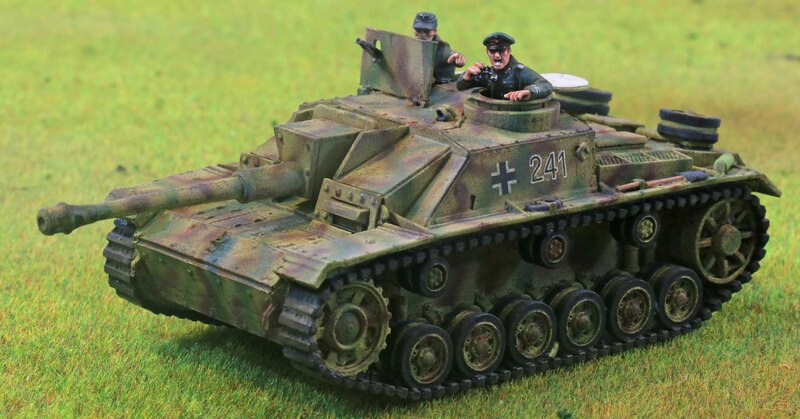 251/22 and a SdKfz. 250/9. 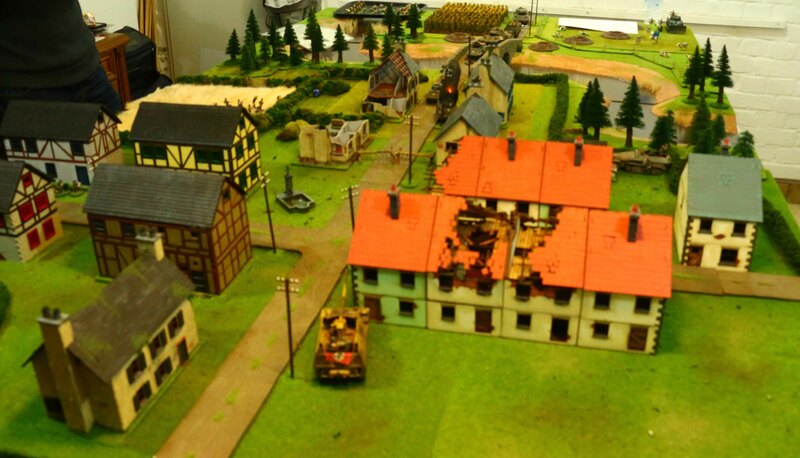 Both sides had some off-board artillery. We rolled to see who would play which side and Martin got the Americans and Julian and I the Germans. We were playing the Road Block scenario and the Americans were allowed to set up the majority of their forces as far as the river. 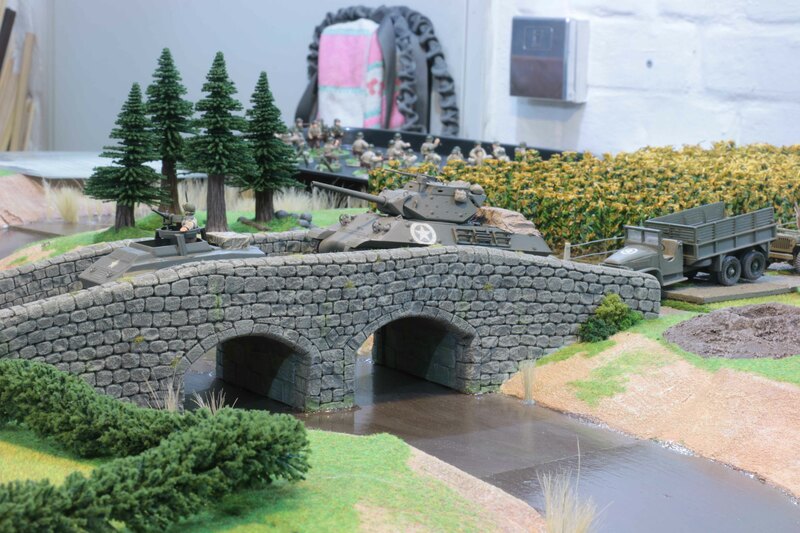 Martin put the armoured command car on he bridge with the M10s, some of the truck mounted infantry and a Dozer Sherman behind them. 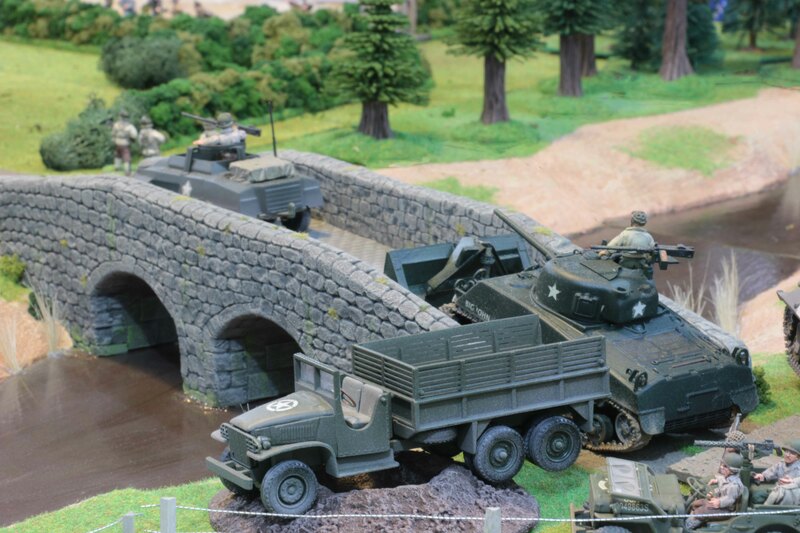 The Greyhounds were allowed to deploy on the German side of the bridge. 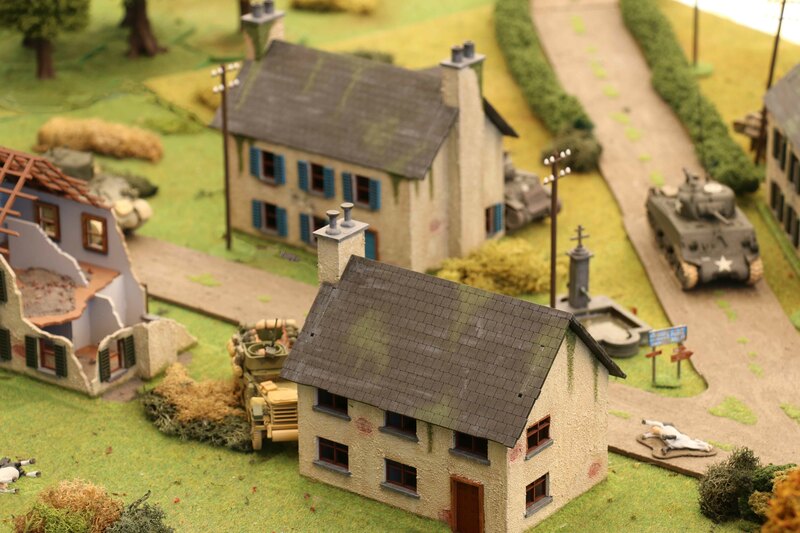 The German Volkssturm was dispersed throughout the village and one of the fields on the flank. 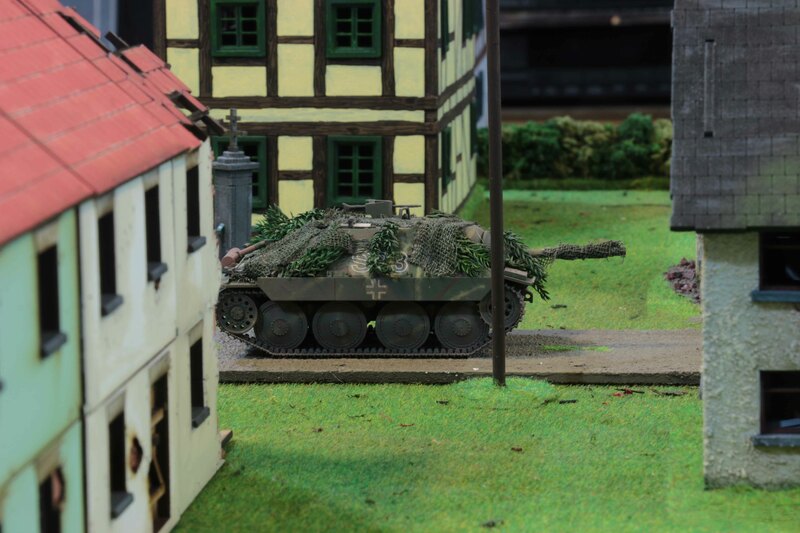 The Panzergrenadiere and Hetzer were hiding inside the village, while the Hornisse was waiting at the edge of the village with the bridge in sight. 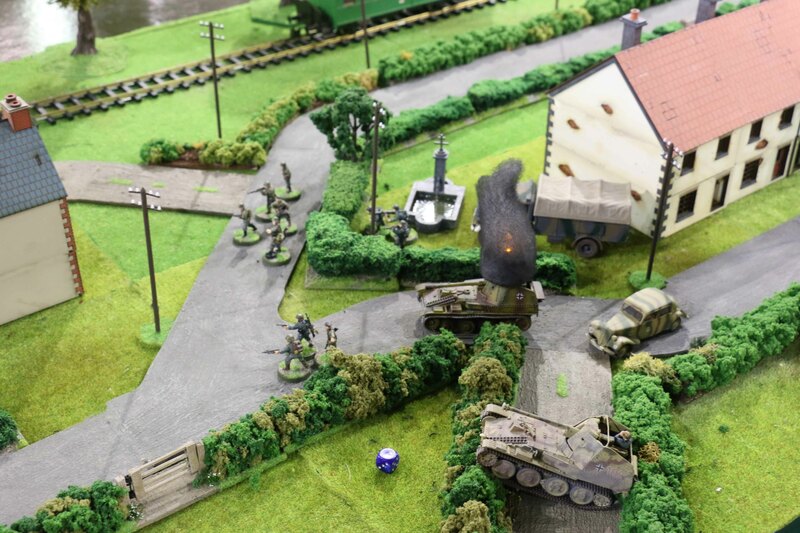 We took a slight risk as the German players, by not putting any scout units on the table, which meant we would start the game by drawing a chit. 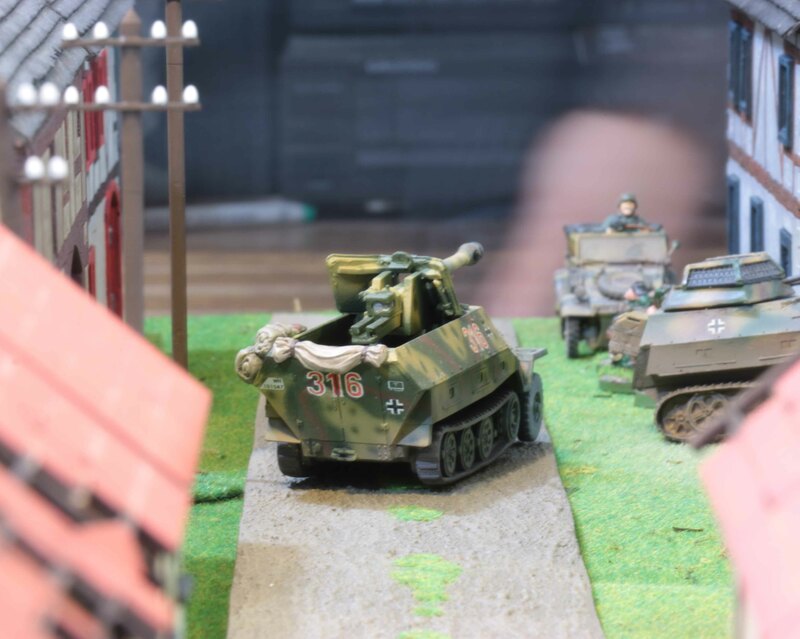 In retrospect this was the best decision we could make, since we drew a breakdown counter, which we played on the armoured command car on the bridge, which got an immobilized result. So Martin had to start shuffling vehicles around to get the Dozer in position. 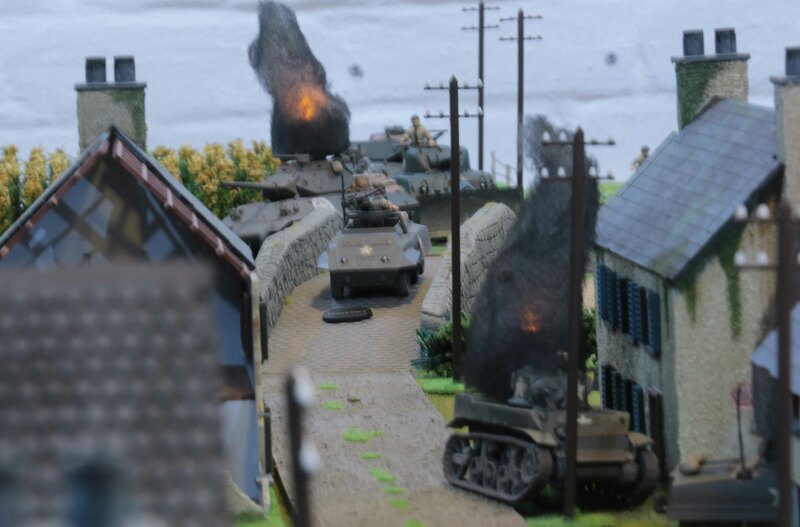 But while he was doing so, the Germans called in some artillery on the bridge, which took out the command car for good and set the M10 ablaze. 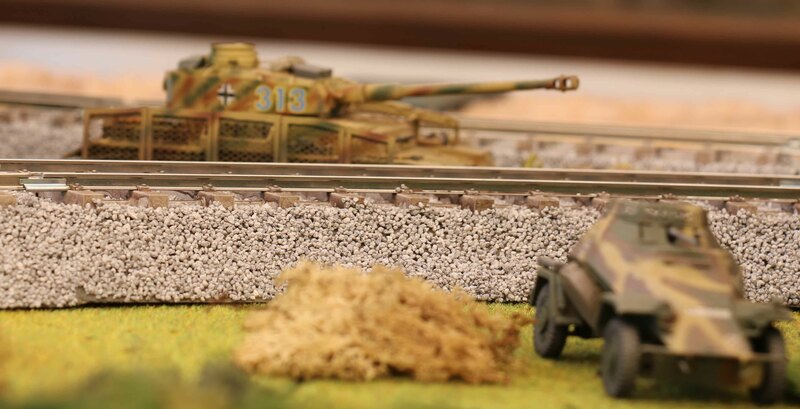 So when the Dozer arrived, it had to start by pushing the tank destroyer aside. But this was not the only problem for the Americans. when it was clear, that the bridge would be blocked for the foreseeable future, the Greyhounds chose to dash into the village to hide. 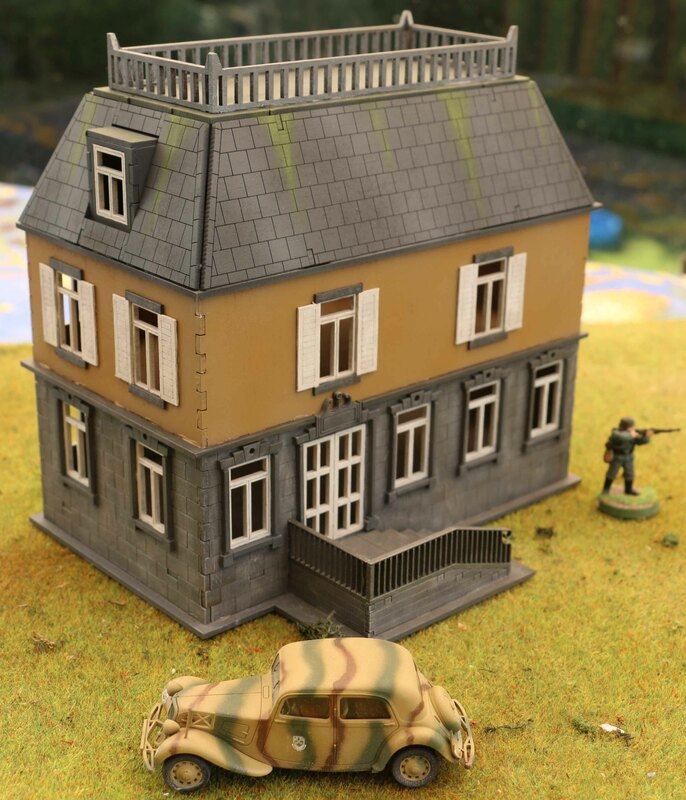 Which proved to be a bad decision, since the lead Greyhound drove past one of the buildings where the Volkssturm was hiding. 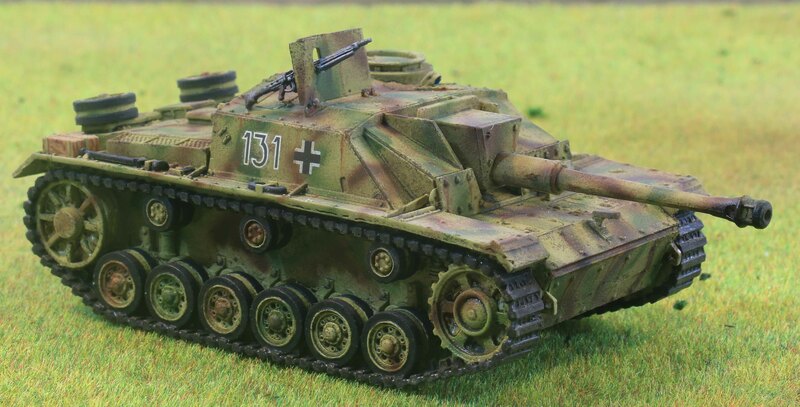 A Panzerfaust into the rear was a reward, after which it blew up. All in all it took the dozer three turns to even get into position to try to clear the command car off the bridge. 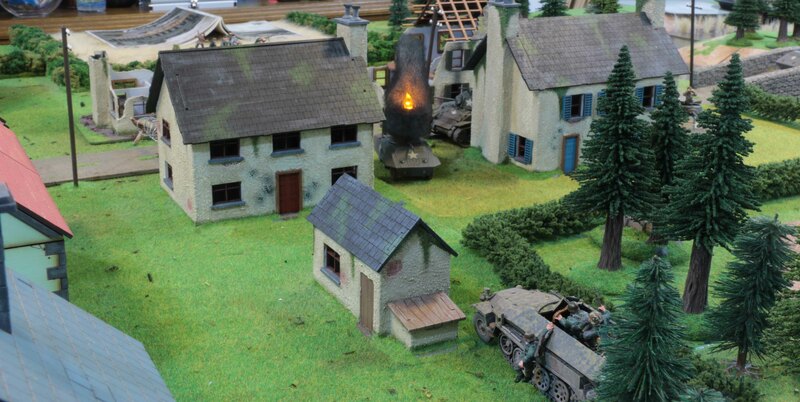 During that time the came under constant German artillery fire. 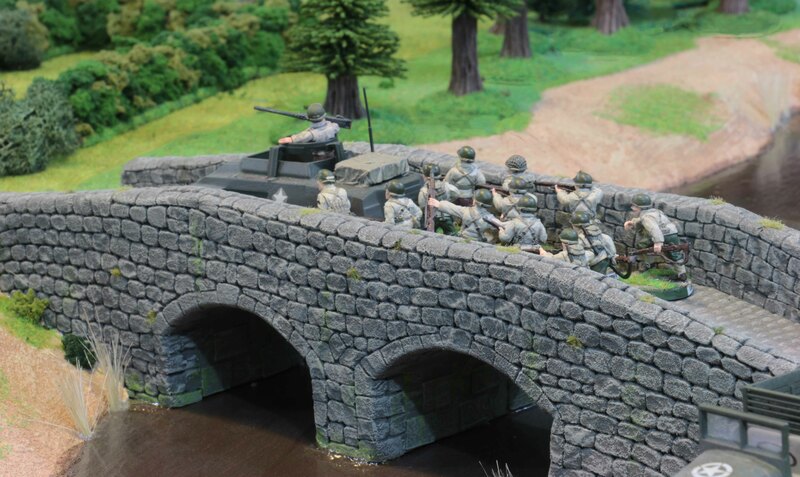 To minimise their losses, the American infantry dismounted to disperse and get across the bridge. 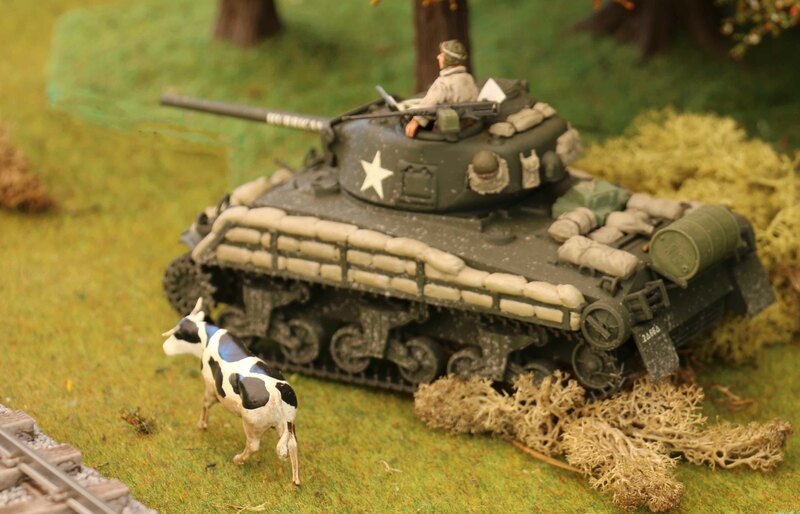 But while doing so, the American infantry became pinned by fire from the Volkssturm in the fields. 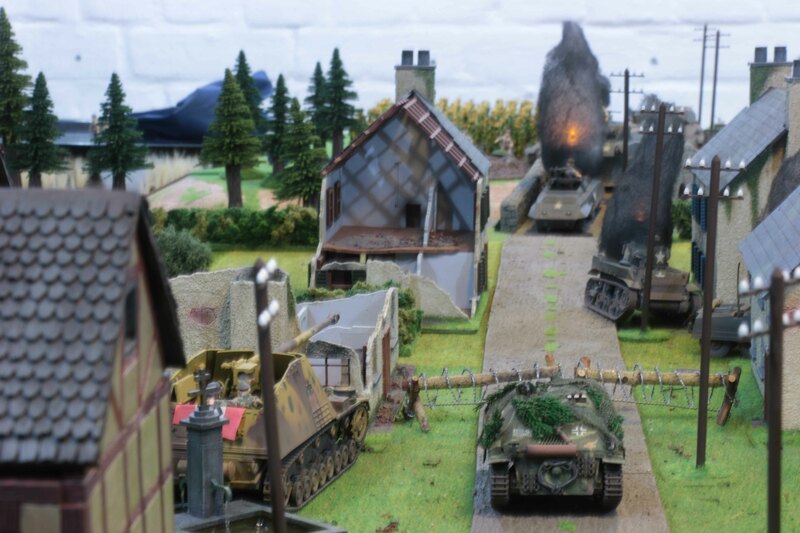 And to make matters worse, by now the remaining German armour had arrived on the table and were taking up positions to counter any American moves off the bridge. 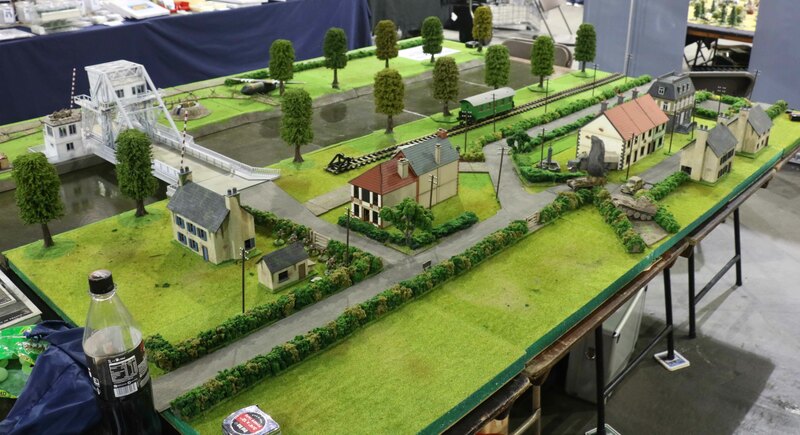 With the bridge cleared, the Americans finally managed to get their own spotters to a place where they could actually call in effective artillery fire on the German spotters killing them, but it was too little, too late. 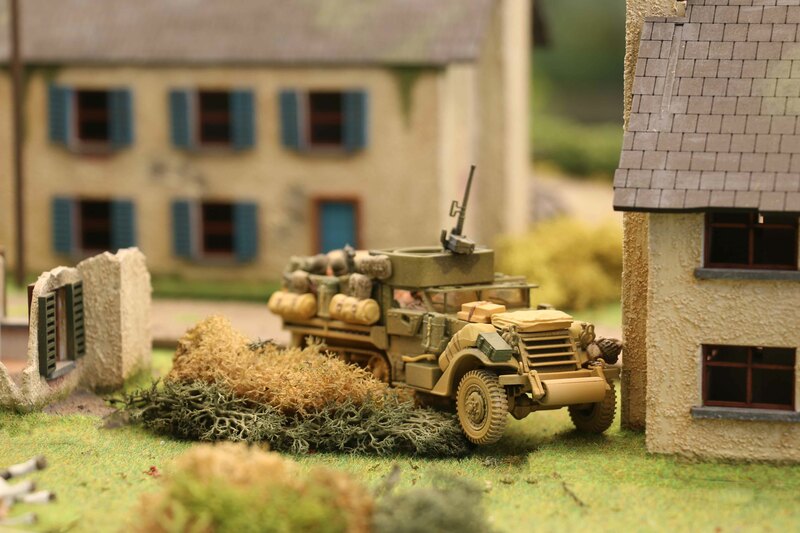 By now the Germans were in positions where they could target anything moving across the bridge from three sides. By now the American force was close to breaking to breaking anyway. And when the Dozer started to push the command car, i was hit by an eighty-eight shell from the Hornisse. At this point no coordinated push would have been possible anymore and the Americans withdrew.